Since its formation in 1986, CONAIE has led the indigenous peoples of Ecuador from relative isolation to a position at center stage of Ecuadorian society. CONAIE is the representative body that guarantees indigenous people the political voice that has too long been denied them, and that expresses their needs and goals within a rapidly changing world. As indigenous people we consider ourselves part of the environment. Our traditional ways allow us to live in harmony with nature, but today our homelands are rapidly disappearing. On the coast, the highlands, and the Amazon unregulated logging, mining and pesticide use imperil the environment. Oil extraction in the Amazon has already caused the extinction of the Tetete and Zaparo nationalities and continues to threaten indigenous peoples. CONAIE proposes alternative forms of development that combine traditional knowledge with Western science to promote balanced ways of living with the environment. CONAIE is an autonomous indigenous organization, independent of political parties, or any state, foreign or religious institution. 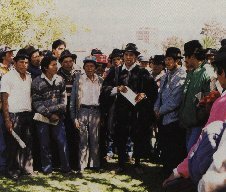 CONAIE is part of the historic struggle for the rights of indigenous peoples and to build a plurinational state. Indigenous nationalities are peoples with common histories, our own languages, governed by our own laws. CONAIE works primarily to strengthen indigenous organizations while we support specific community demands such as territory or water rights, and challenges government policies that threaten indigenous peoples. Through CONAIE the indigenous people of Ecuador have demonstrated that we are willing to defend our identity. With dignity, we have peacefully risen up by the thousands to demand a voice...now we are heard. A people without land is a people without life. From the land we get food, medicines, materials for ceremony, clothes, tools, and crafts. Land is our sustenance. Because of demographic pressures and the expansion of export agro-industry in the Andean highlands and colonist encroachment in the Amazon, each year indigenous communities are left with less land to produce. A key aspect of CONAIE's work is the struggle to guarantee land for our peoples. We count on our own legal team and uses diverse mechanisms to ensure the legalization of our territories and access to mother earth. CONAIE promotes long standing traditional forms of land use such as cooperatives, organic farming, natural pest control management, and trading amongst ourselves. The rich diversity of indigenous cultures in Ecuador is rapidly disappearing. 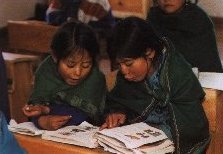 CONAIE actively promotes indigenous language and cultures so that they may survive. In 1989 CONAIE signed a historic agreement with the Ministry of Education that established a national program of bilingual, bicultural education designed and managed by CONAIE and its member organizations. CONAIE teaches new generations to take pride in their indigenous identities, and to use their own languages as well as Spanish. CONAIE promotes celebration of ceremonies including the annual Sun Celebration (Inti Raymi). We also promote natural medicines and traditional healing practices. CONAIE has taken a leadership role in international indigenous networking. Our work includes the '500 Years of Resistance Campaign' and the Continental Indigenous Coordinating Commission. Awards include: The Lettelier-Moffit Human Rights Award, the Goldman Environmental Justice Award, the Inter-American Foundation Fellowship. 45% of Ecuador is indigenous, yet there is only one indigenous member of Congress (1995). 80% of the rural (mostly indigenous) population lives in absolute poverty. 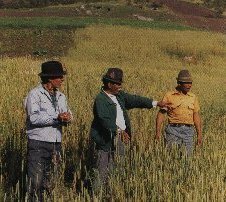 Indigenous farmers produce 75%-of Ecuador's basic foods, yet we only have 35% of the arable land. Ecuador has the highest rate of deforestation in the Americas. At this rate our forests will be depleted in 40 years.